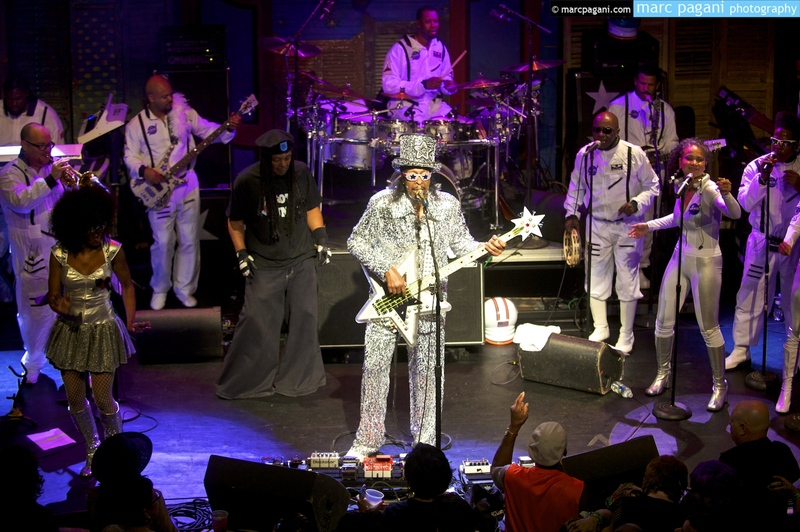 Bootsy Collins celebrated his 62nd Birthday recently with a late night BASH down in the Big Easy at the House of Blues New Orleans, a Decatur Street venue located right in the heart of the French Quarter. NOLA’s DJ Soul Sister opened up the night layin’ down rare soul and funk vinyl grooves before the main attraction arrived. As expected the band and man-of-the-hour made a grand entrance, as Collins’ full band hit the stage dressed head-to-toe in space suits, each removing their faux-glass dome headpieces simultaneously before breaking into the night’s first track. Starting just minutes before midnight, the packed-out Bootsy Collins’ crowd reveled in the bass-centric space-funk until around 2 am. Bootsy, as you likely know, is quite a showman and one-of-a-kind character. 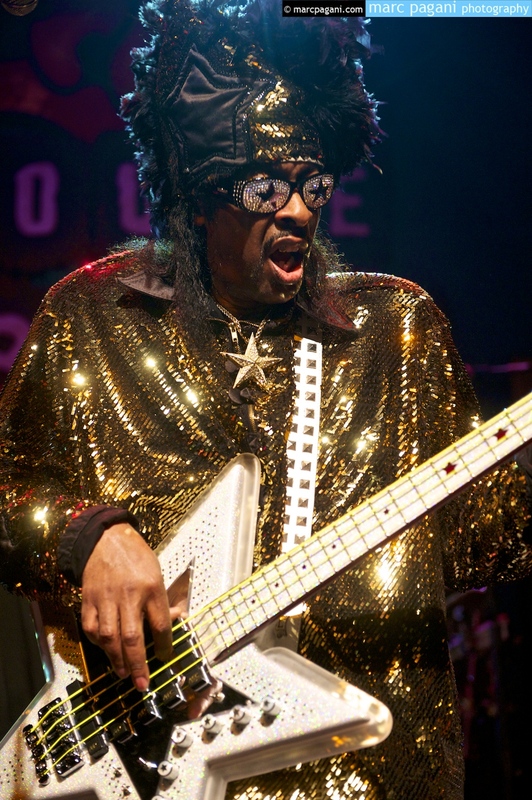 But don’t let the flash of his heavily-sequined costumes detract from the fact that he still is one of the world’s greatest funk bass players and this was once again proved on this Friday night in NOLA. Collins got the crowd going countless times throughout the night, but perhaps the most noteworthy moments were when the front man changed costumes for the first time, led a “Who Dat!” chant and unveiled a Saints jersey underneath. Later in the show, Collins would jump into the crowd, hug and head bang with several crowd members (including yours truly) before climbing on the soundboard and revving the crowd to a level that arguably only Bootzilla himself can. With a downright magnetic and compelling stage presence and an on-point and focused show musicially, this one should rank high on the concerts I’ve been lucky enough to cover in 2013. Photographer Marc Pagani was in the house to capture the set and his photos provide a visual soundtrack to one grandiose party. Check out the gallery below.